Welcome to the Great Lakes Branch of the Anthroposophical Society website. The purpose of the branch is to coordinate and promote events of interest to the anthroposophical and general community in Ann Arbor and Southeast Michigan, collaborating with the Greater Detroit Branch. 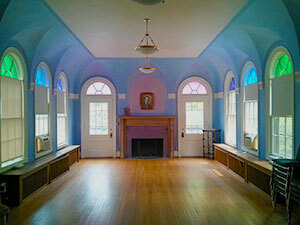 Our home is located at the beautiful Rudolf Steiner House, home of the Anthroposophical Society in America. 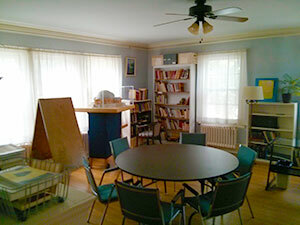 The activities that take place at the Rudolf Steiner House include several weekly study groups, monthly lectures, and occasional workshops and artistic events. Additionally, there are festivals and a few theatrical performances organized throughout the year. On-going events are listed below, special events are in the column at right. The Rudolf Steiner House includes a reading/lending library containing most of the titles of anthroposophical literature. 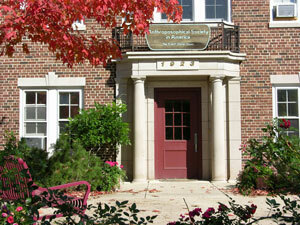 The library is open during office hours, Monday to Friday 9am to 5pm. Use of literature at the library is free. Members may borrow books for an annual fee of $15/$10 (first year/subsequent years). Most, but not all, events take place at the Rudolf Steiner House, located near downtown Ann Arbor at 1923 Geddes Ave [map]. Please contact each event coordinator for information on a particular event. For Steiner House reservations and questions email Cynthia Chelius, or call (734) 662-9355. Every second and fourth Monday in the month, 7:30-9:00 p.m.
Great Lakes Branch Study Group is reading, studying and discussing Cosmosophy, 11 lectures by Rudolf Steiner, given in Dornach, September 23 - October 16, 1921. Membership in the Society and Branch is a prerequisite to join the study group, but everyone is welcome to visit and explore the group’s three-fold way of study before making a commitment. The group meets at the home of Jerry and Penny Kruse. Contact Andree Naylor for details (andree@remove-this.umich.remove-this.edu or 734.971.6217). First Tuesday of the Month Introductory Lecture Series, October through May (except January). See Special Events for the currently scheduled lectures. For further information, contact Dwight Ebaugh at dwight.ebaugh@remove-this.gmail.remove-this.com or 517.927.3696. Location: Rudolf Steiner House. Fourth Tuesday of each month, 7:00-8:30 p.m.
Biodynamic Beekeeping Study Group – Contact Eileen Dickinson (email) for more information. During the summer, the group may visit members’ bee yards. You may sign up to be on the email lists of both this group and the Biodynamic gardening group. Wednesday Night Study Group of Ann Arbor – We read and discuss the books and lectures of Rudolf Steiner, including the basic books, as selected by the members of the group. We welcome new members - beginners, intermediate, and advanced. The group is currently reading Rudolf Steiner's 1911 lecture series titled From Jesus to Christ. Contact Linda Britt for further information at (734) 417-7810. The Harbor Springs Study Group meets in the Harbor Springs area, Northern MI. Contact Mary Adams at 231.838.8181 for further information. The group is currently studying The Philosophy of Spiritual Activity - A Philosophy of Freedom. The group also shares seasonal festivals together. The Rudolf Steiner Study Circle of Ann Arbor Effective December 23, 2016, this study group merged into the Wednesday Night Study Group of Ann Arbor(see above). Alternate Saturdays (by consensus), 7:30-9:00p.m. The Detroit Branch Study Group reads books and lectures by Rudolf Steiner. Contact Susann or Bart Eddy 248.945.9039 for information regarding current reading and location. Members of the School meet regularly for class lessons. Blue cards required. Contact Douglas Miller 810.659.2204 or Quentin McMullen 734.761.8080 for more information. (go to link for information). Traditional Three Kings Observance facilitated by Alex Nitsche at 7:00 p.m.
First Tuesday Lecture with Professor Frederick Amrine at 7:30 p.m.
First Tuesday Lecture with Mary Stewart Adams at 7:30 p.m.
First Tuesday Lecture with Robert Thibodeaux at 7:30 p.m.
April 20 (Easter Saturday): Easter Festival Gathering, 3:00-5:00 p.m.; The remembrance of Christ in ‘Limbo’; Rudolf Steiner’s watercolor, “Easter (The Three Crosses)” was painted in April 1924 around Easter tide. First Tuesday Lecture with Hazel Archer Ginsberg at 7:30 p.m.
June 14/15 (Friday / Saturday): Nicanor Perlas lecture on Friday at 7:30 p.m. and Nicanor Perlas full day workshop on Saturday from 9:00 to 5:00; both events at the Rudolf Steiner School of Ann Arbor Lower School on Newport Road.